This annual ‘Good Will at Christmas’ appeal is one that aims to bring happiness to ill children who must spend their Christmas Day in St Bernadette’s Ward, University Hospital Galway. The main aim is to bring smiles to their faces when they wake up on Christmas morning. This Saturday, DNA Nightclub encourage customers to bring along a new, unwrapped present and in return for this act of kindness they will offer complimentary entry as a thank you. All the donated presents received on the night will be handed over to the Children in the Paediatrics Unit, UHG. This initiative is a simple, yet effective one and has been run by the team for numerous good causes throughout the past few years, including Temple Street Children’s Hospital last year. 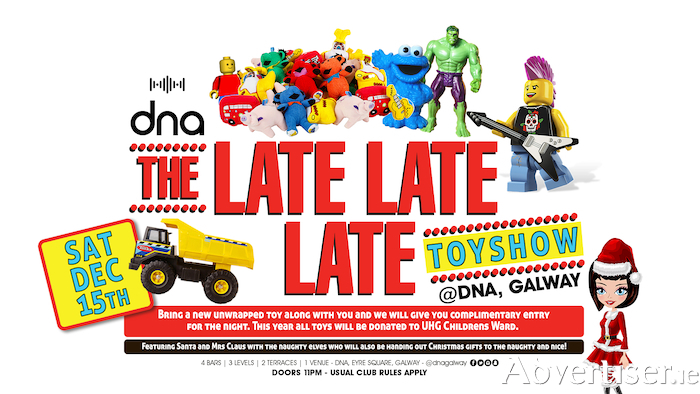 Visit DNA Nightclub this Saturday night, make a toy donation and bring Christmas Cheer to others during the festive season.